All of the items in the Biennale Shop are available by donation. It’s another way of supporting our exhibitions, events, and educational programs. 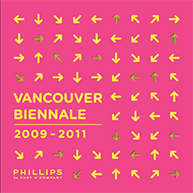 Simply click on the item you’re interested in, and you’ll be directed to the Vancouver Biennale Canada Helps page. Make sure you select the “fund” that matches the item you want and provide your full name, address, and phone number so that we may arrange for pick-up or delivery. Everyone looks great in pink and yellow! We also have Vancouver Biennale buttons, wristbands, and water bottles ($2) and many more collaterals for sale at the Vancouver Biennale office. To buy in person, simply visit us at 290 W 3rd Avenue in Vancouver! 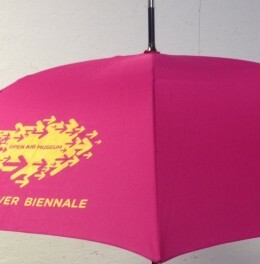 Pink Curve Handle Umbrella$50 Donation Bring a splash of colour to a rainy day. For local pick-up only. Exhibition Catalogue$50 Donation Photos and text documenting the 2009 - 2011 exhibition. 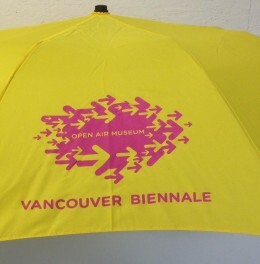 Yellow Travel Umbrella$25 DonationCompact and bright, great for staying dry and visible on rainy days. 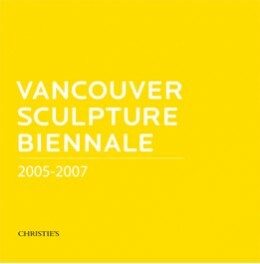 Exhibition Catalogue$50 DonationPhotos and stories documenting the 2005-2007 exhibition. 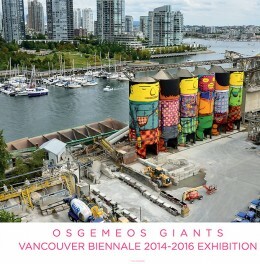 ISBN 978-1-9995287-2-0 Limited Edition OSGEMEOS Giants Double Sided PosterPrices from $250This DOUBLE sided, numbered, limited edition poster is exclusive to the 2014-2016 Vancouver Biennale and is the only officially sanctioned artwork of the GIANTS by the artists OSGEMEOS.